DOODLE ART: Visoth Kakvei is a graphic designer from Cambodia, USA whose works are cheery and quirky. Doodling is considered as an art but it can still be fun and could every way tend to be expressive. Childlike scribbles highlighted with brilliant ideas of art can end up in beautiful doodles. 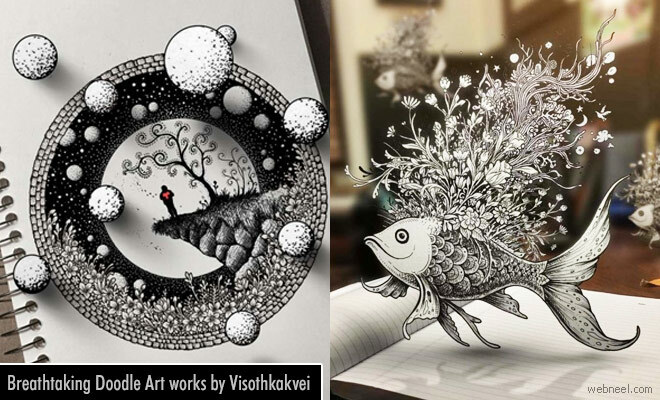 Visothkakvei augments complex and delicate doodles with beautiful effects of depth and three dimensions. One of his doodles he uses photoshop to create an amazing work of art through the flying leaves that make it look real with every leaf. With random and abstract lines combined with digital enhancement visothkakvei takes doodle art to next level.